NORTH KOHALA, Hawaiʻi - Rainfall rates up to 3 inches per hour have been observed, and Kawainui Stream has reached 6 feet. Police report flooding along Kohala Mountain Road, Kawaihae Road and near Waimea. UPDATE (7 a.m. on Nov. 4) – There are no weather alerts in effect for Hawaiʻi Island on Sunday morning, however the story of a flash flood search and rescue that took place Saturday afternoon is detailed in an early morning fire dispatch. 13 people were rescued from a dangerous stream in private hillside pasture with steep cliffs above Anna’s Ranch in Waimea, according to the Hawaiʻi Fire Department. A short time later, four others were located in different areas stranded on the rocks along the stream. They were rescued and then airlifted to the staging area to be treated by waiting medic units. A while later the final three hikers were located on the rocks behind a large waterfall. Extrication involved technical rope rescue and repelling/ascending 150-20 ft. cliffs in dark, windy and rainy conditions over a five hour period. No serious injuries. 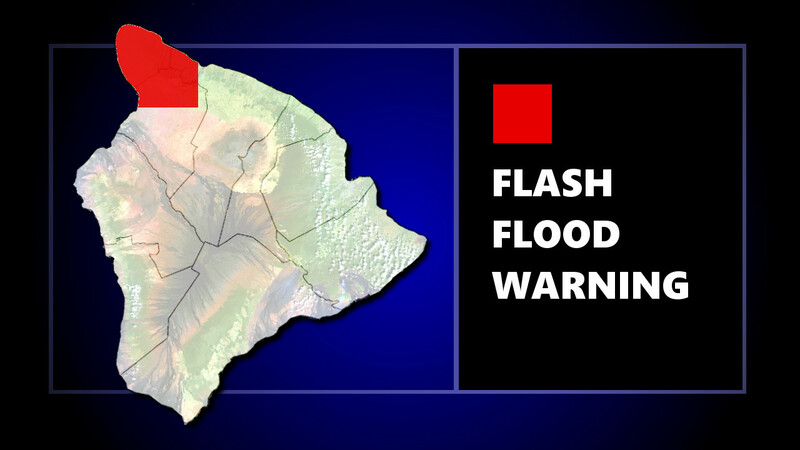 UPDATE (8:30 p.m.) – The Flash Flood Warning for the Kohala area is no longer in effect. Instead, a Flood Advisory has been issued for the northeast side of Hawaiʻi Island until 11:15 p.m.
At 811 PM HST, radar indicated heavy rain along the northeastern slopes of the Big Island. Rain was falling at a rate of 1 to 2 inches per hour. Expect elevated water levels in rivers and streams within the advisory area. (BIVN) – The National Weather Service in Honolulu has issued a Flash Flood Warning for the Kohala-area of Hawaiʻi County until 8:15 p.m. HST. “Locations in the warning include but are not limited to Pololu Valley, Kohala Ranch, Hawi, Halaula, Kamuela, Kapaau, Waimanu Valley, Puako and Waipio Valley,” the National Weather Service said.